Han Solo could have made the original “I’ll be back quote!” rather than Arrrnuld. 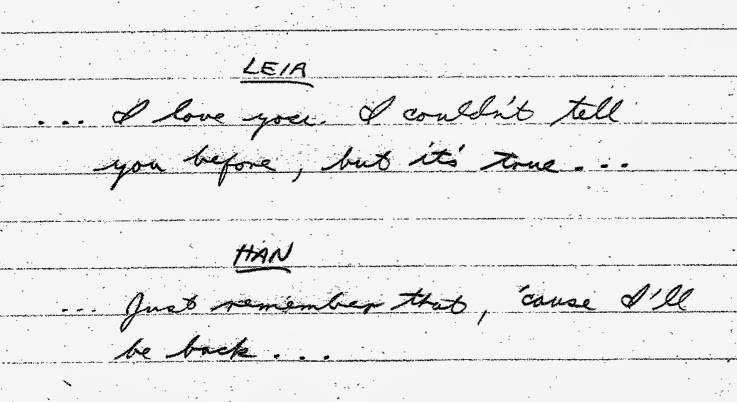 Princess Leia was subject to one of the most famous ad libs in cinema history - that being Han Solo's response to her declaration of her love for him in The Empire Strikes Back- "I know". That line and the look on Carrie Fishers' face solidified the love between the two. There would be no more arguing about 'Committees' between them. Harrison Ford apparently made it up at Irvine Kershner's suggestion. And it’s probably with good reason that Kershner suggested the line to Han Solo as it looks like Lawrence Kasdan had scripted “just remember that, cause I’ll be back” which on paper just seems a little naff. But was it really an ad lib? Half of that line is of course is something that a certain Austrian cyborg sent from the future to the year 1984 said in The Terminator…. If Han had of said it, would the line have become so famous? Possibly not but who cares as “I know” is even better. Leia got to return the by then then famous line to Han Solo in Jedi during the Battle of Endor. So this completely contracts the notion above that Kershner came up with the line. The key thing to note is that Ford recognized publicly that it was subject to a collaborative process.